Before you read this topic, you should better know about IP forwarding. IP forwarding is a technique that can be used to allow a workstation/machine to forward packets from one network to another network. The machine sits netween two or more LANs and work as default gateway. This IP forwarding technique is also used by attackers to perform Man In Middle Attacks. Now how to use Window XP professional as Router.. ? The Router is needed to transfer traffic or packets from one network to another network or access Internet. Now by using Win XP as router the benefit is you don’t have to buy additional router and so can save some money. This approach is not so common practiced in Windows XP, but it works. Note: This window XP pro machine can never replace router completely. The XP machine that will work as router will only provide communication between different networks, how ever it will not provide other features like VLAN routing, Packet filtering, ACL, etc. 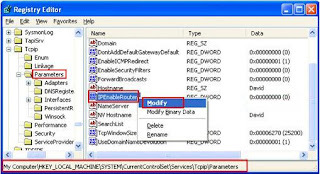 If you want to use these functionalities then you have to use Router only. As an example, consider you have 7 computers and 2 network switches, and need to create 2 networks that can access Internet, so how to do it?? 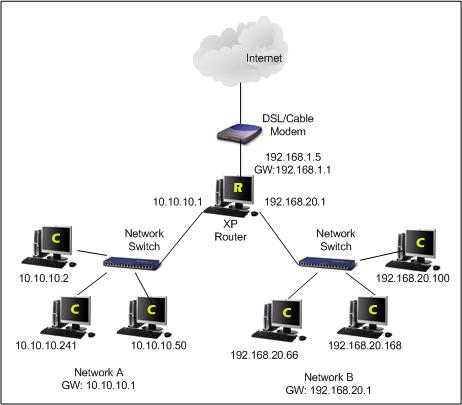 For this, one of the computers must be equipped with 3 network cards(NIC) and one of the network cards is connected to cable/DSL modem to access Internet, and other 2 network cards will connect to switches. So this computer will act as a router..!! 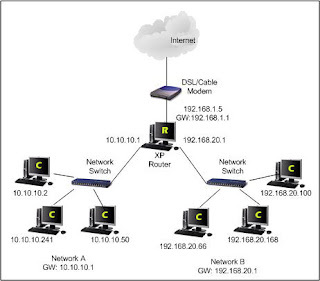 The computer marked as R in diagram will be our router, and computers marked as C are the clients. 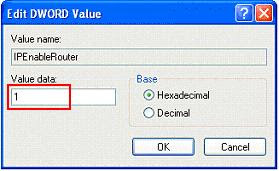 Configure the network cards on the router with following information. Configure all the client computers in network A with following information. Configure all the client computers in network B with following information. 1. Go to Start and click Run…, then type in regedit & hit enter to run registry editor. 3. The IPEnableRouter window will appear. Type 1 as Value data and click OK.
4. Close the regisrty editor and reboot the computer. After rebooting, all the computers should be able to access Internet and also share the file/printer between network A and B. Caution : IP forwarding will only work after rebooting the computer. So don’t forget to reboot…! !